Eighth National Games: Nepal Police Club clinches two gold medals in table-tennis - Integration Through Media ....! DANG: Nepal Police Club has clinched two gold and two silver medals in the two separate matches played under the 40th table-tennis championship as part of the Eighth National Games. Similarly, Armed Police Force (APF) has bagged two bronze and the Tribhuvan Army Club two bronze. Nepal Police’s Shntu Shrestha bagged gold medal; Pradip Roka, also from Nepal Police won a silver; and Dilus Shrestha and Shiva Sundar Goche of APF a bronze each, in the male’s singles event held today. 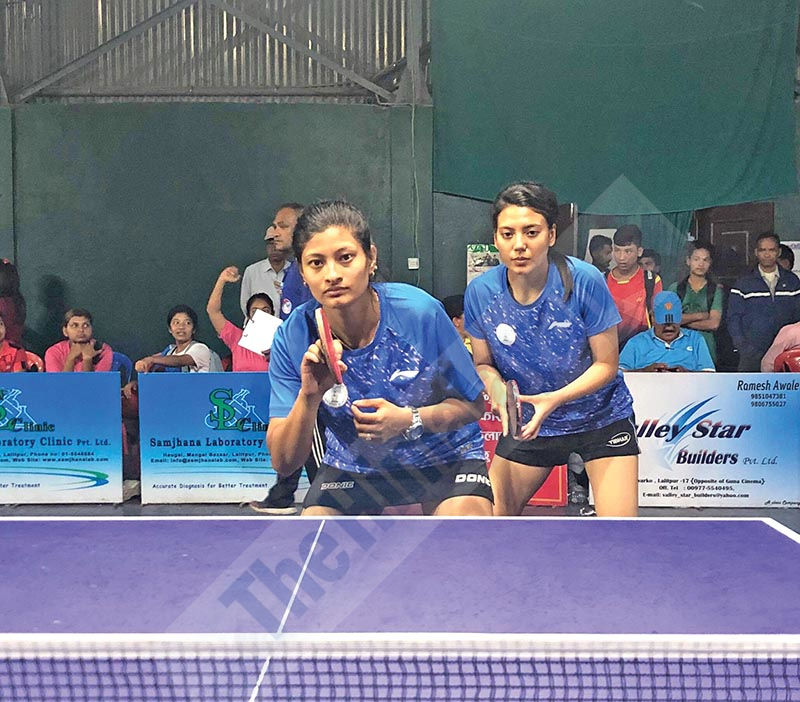 Similarly, Babita Shrestha of Nepal Police clinched gold; Elina Maharjan, also of Nepal Police, bagged silver; and Rabina Maharjan and Diksha Tmang of Tribhuvan Army Club bronze medals, in the final women’s singles event held today. Nepal Police had won four gold medals and one silver medal in the five competitions held on Friday. The APF Club bagged a gold medal, two silver and two bronze while the Tribhuvan Army Club won two silver and two bronze medals. Matches under table-tennis which started on April 10 have concluded today. Various seven events were held under the National Table-tennis Competition this time. Meanwhile, the Far-west State has won the highest number of gold medals in the wrestling competition held under the Eighth National Games. Out of the 20 players who represented the State, 15 came home with medals under various events of wrestling. All the events under wrestling were held in Kapilbastu district of State-5 and concluded on Friday. All players competing in wrestling from the Far-west State were from Kanchanpur district. Those winning gold medals were Manisha Singh of Bedkot municipality in the women’s 50-kg weight category, Shivangi Dubey of Bhimdutta municipality in the women’s 53-kg weight group, Sangita Dhami in the 55-kg weight group, Meera Auji in the 65-kg weight category, Bimala Sunar in the 68-kg weight group and Laxmi Khatri in the 72-kg weight category. Dhami, Auji, Sunar and Khatri are also from Bhimdutta municipality. Similarly, Ambika Bhandari, Koml Khatri and Sapana Chand won silver medals in the 57-kg, 59-kg and 65-kg weight category, respectively. In the male’s wrestling, the competition was held in 10 weight groups. Although the Far-west State could not win gold in male’s wrestling, it was not without medals. Sanjaya Tikhatari and Karan Bhtta each won silver medal in 86-kg weight group and 125-kg weight group respectively. Likewise, Bhuwan Chand, Arjun Gurung, Sandip Chand and Bokas Chand won bronze medals in the 57-kg, 61-kg, 74-kg and 79-kg weight groups, respectively. Monica Chand won bronze medal for the Far-west State in the 76-kg weight group under the women’s wrestling championship.